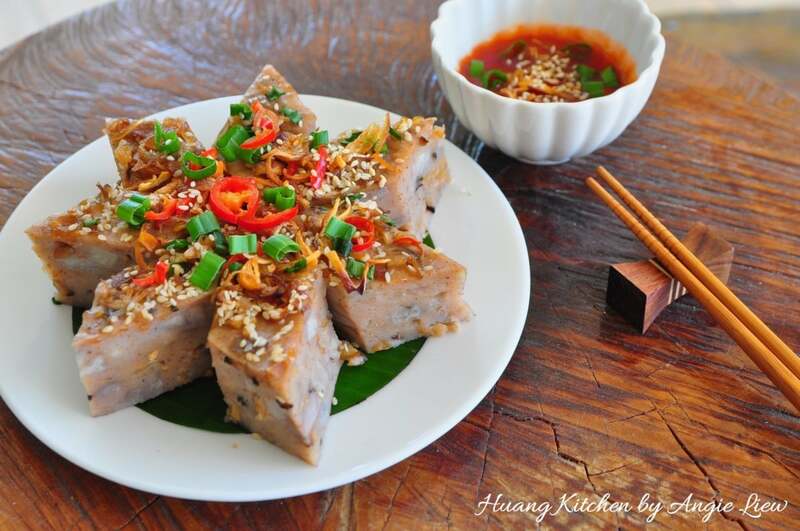 Steamed Yam Cake is a popular snack enjoyed by both Malaysians and Singaporeans alike. 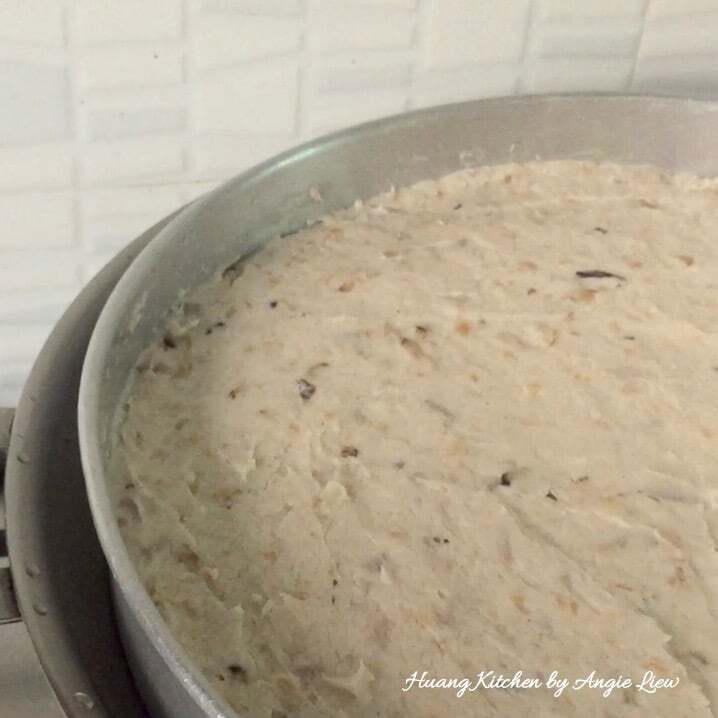 Known as Kuih Keladi, this is basically a steamed cake (kueh) that is made from fresh yam, dried shrimps, dried shiitake mushrooms and a flour batter. There are many versions of the traditional steamed yam cake. 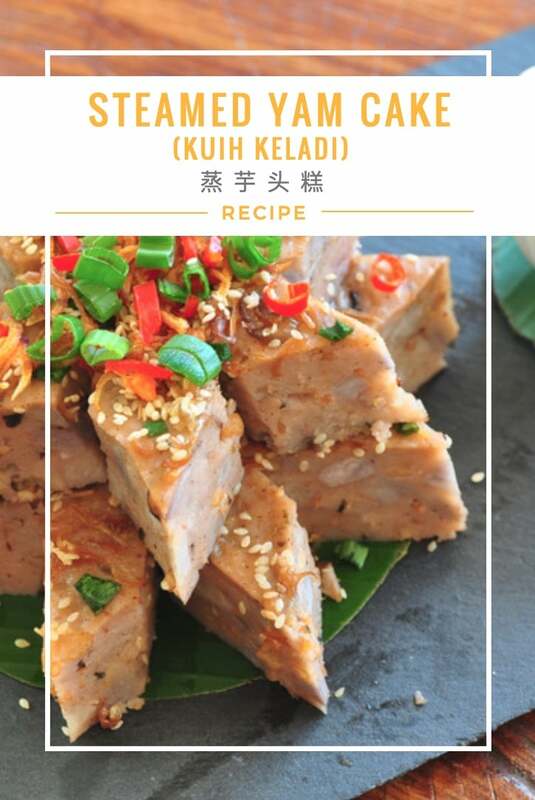 My version is a family passed-down recipe shared by my sister who just love and is very good with all kinds of local Kuehs. It is truly an honour to have the opportunity to learn from her! To make delicious yam cake, we need to choose yam that are fluffy, powdery and aromatic. To enhance its fragrance, the yam is fried together with all the other flavourful ingredients and then seasoned with salt, ground white pepper, chicken stock granules and five spice powder. Dried shrimp and dried mushrooms are a must-have for the traditional steamed yam cake, as they certainly elevate the taste and texture. 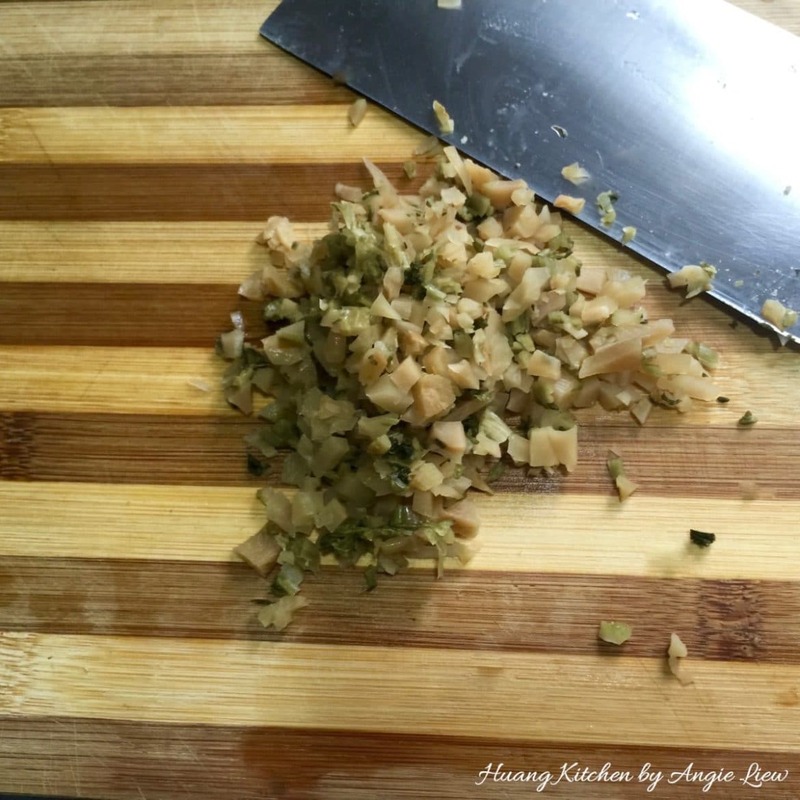 Last but not least, garnishing with deep fried shallots (Click to see the Crispy Fried Shallots recipe) gives the steamed cake such an amazing aroma. 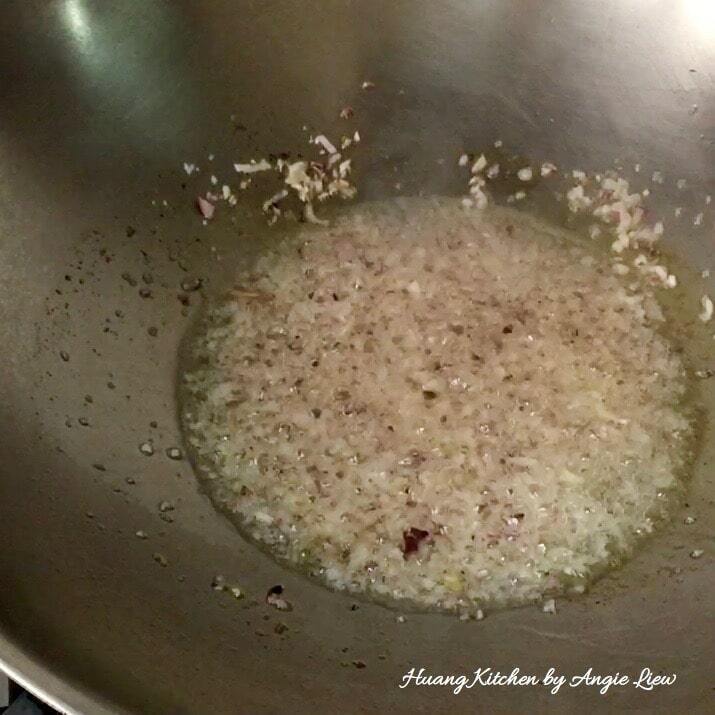 Better still, use the shallot oil from the homemade fried shallots during the cooking process. You as well as your guests will never have enough! Steamed Yam Cake (Kuih Keladi) is a popular traditional Asian snack. 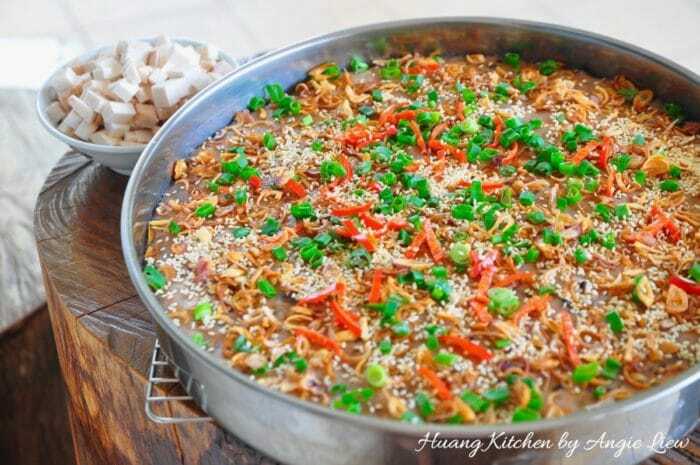 A delicious steamed cake filled with the goodness of yam, dried shrimps and mushrooms! 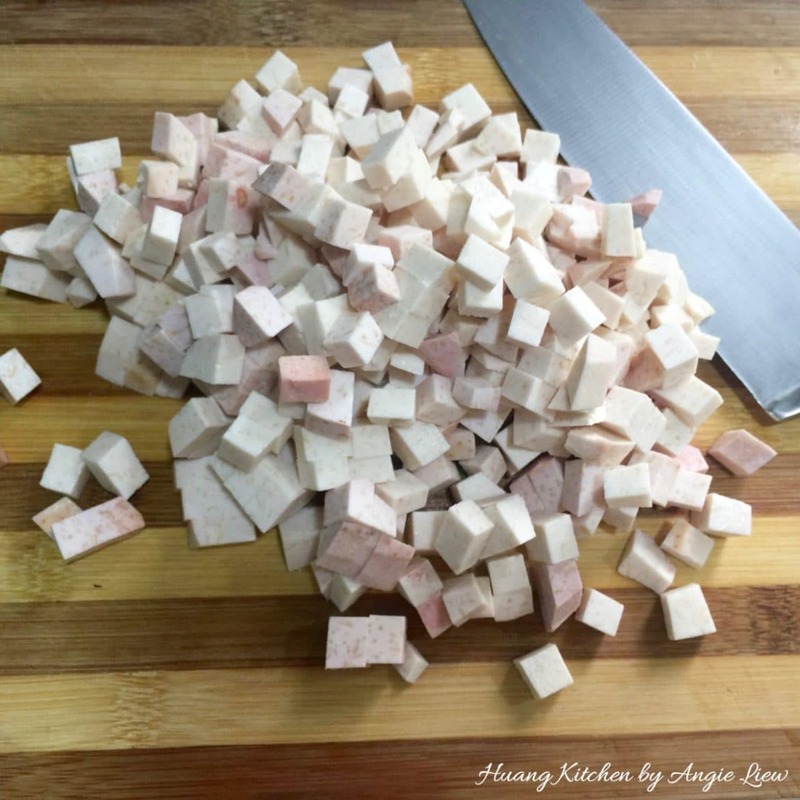 Peel and cut yam into small cubes, about 1 cm cubes. 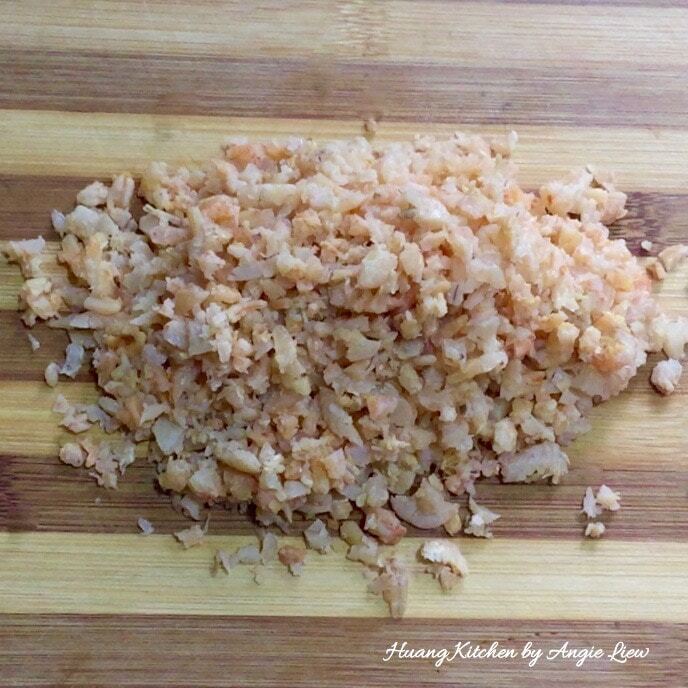 Soak dried shrimps till softened. 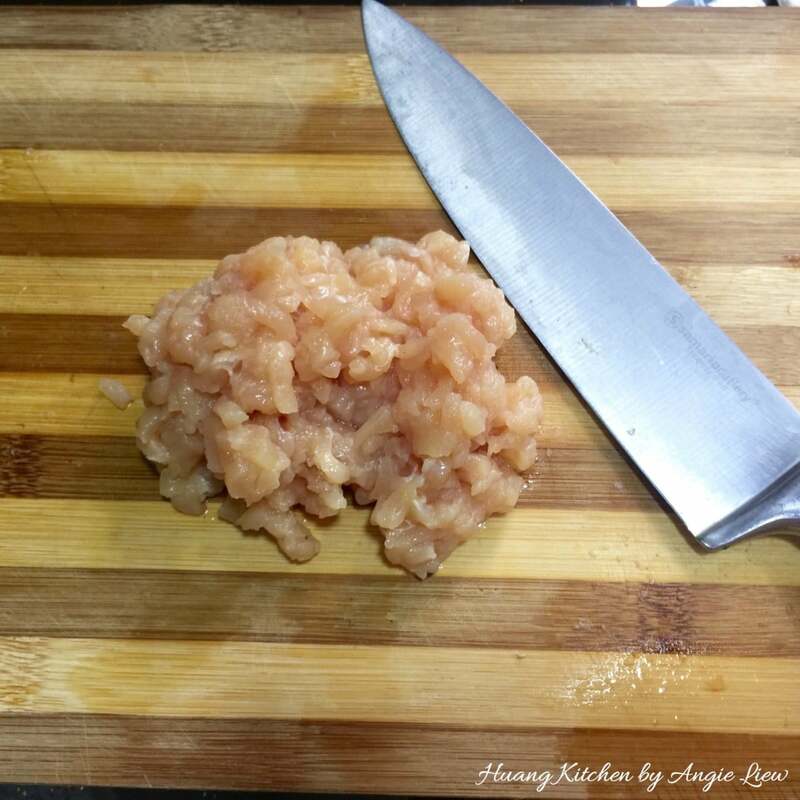 Drain, then coarsely chop. 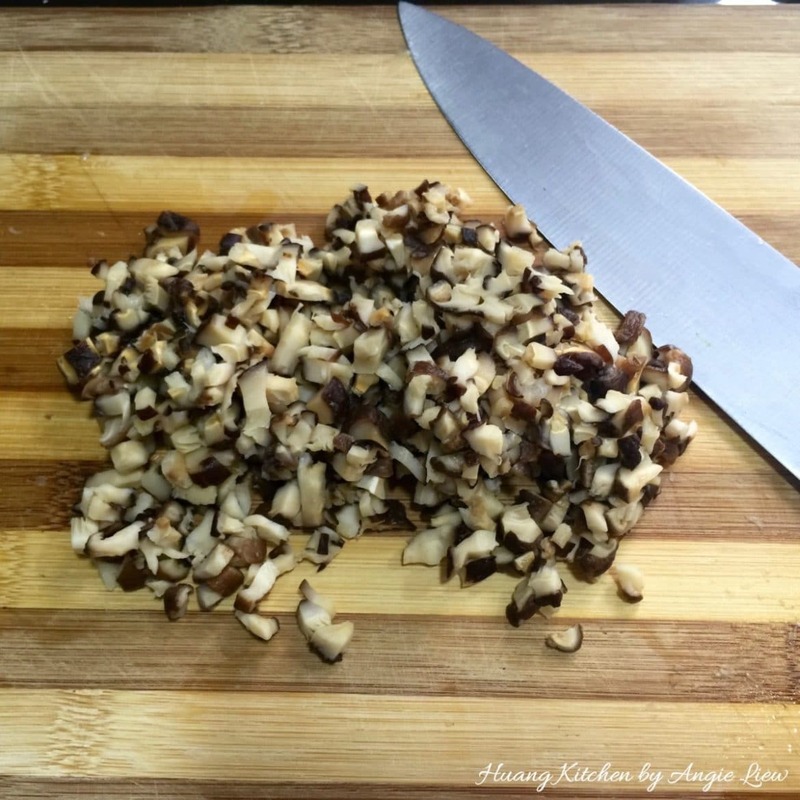 Soak dried mushrooms till softened. Drain, squeeze dry, then coarsely dice. Next, soak preserved turnip to remove saltiness. Then dice into small pieces. First, heat 2 tablespoons oil over medium high heat. 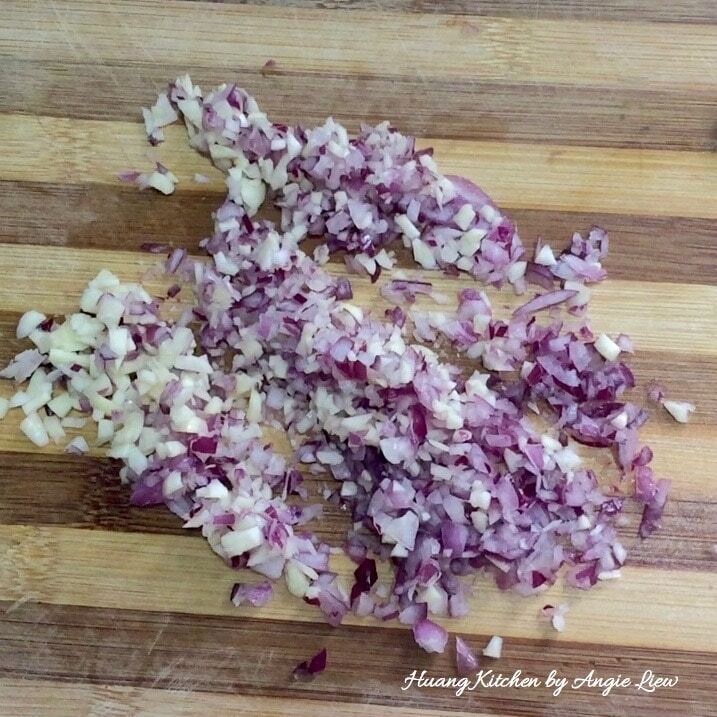 Then fry shallots and garlic until aromatic. 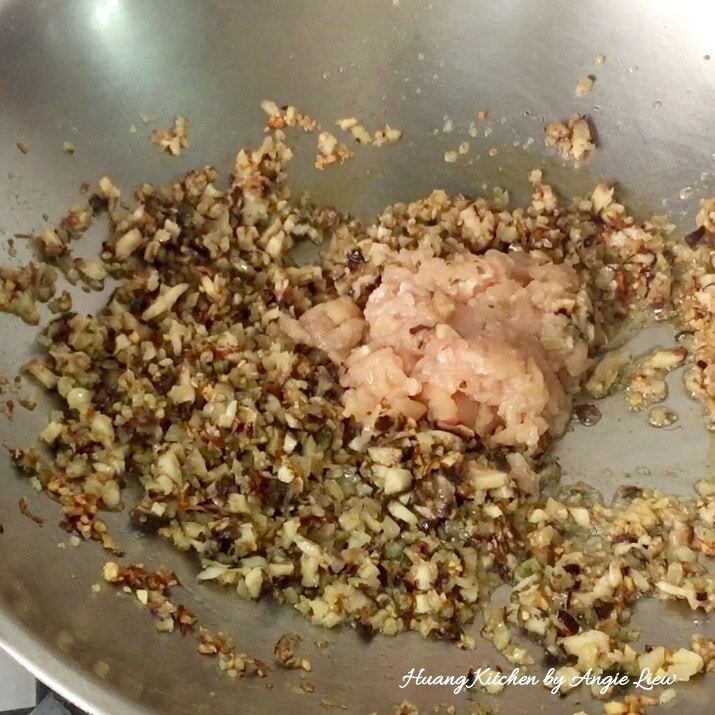 Add in dried shrimps and fry till fragrant. Next add shiitake mushrooms and preserved turnips. Stir-fry till well combined. Add meat and fry till just cooked. Add in yam cubes and fry till about brown. Then, add seasonings and stir to combine. In a bowl, mix rice flour, wheat starch, all-purpose flour, tapioca flour and water. 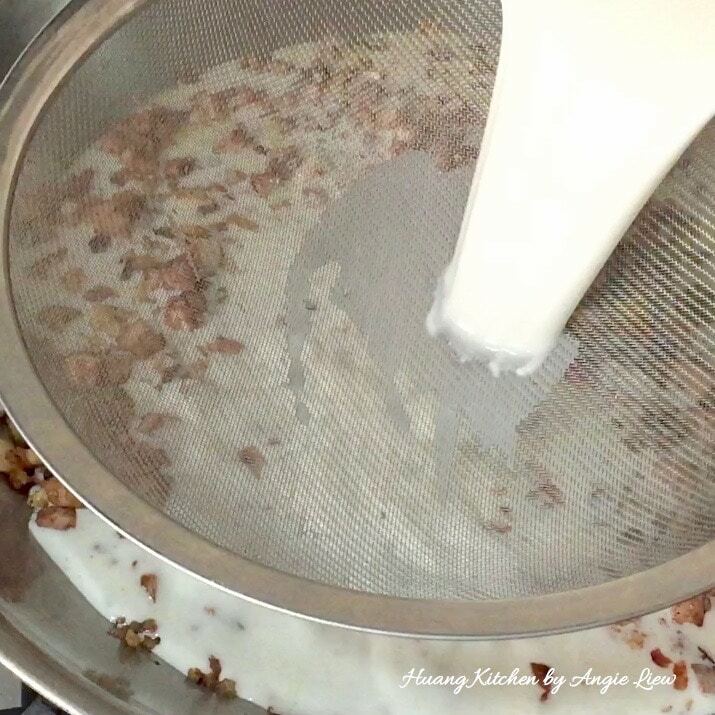 Stir until a smooth and runny batter is formed. Using a strainer, add the batter into the wok slowly. Stir continuously over low heat. As the batter starts to thicken, turn off the heat. Pour in the batter in a greased steaming tray. Press down with a spatula to smoothen the top. Bring water in steamer to a boil and put in steaming tray. Steam over high heat for 45 minutes, or until cooked. Cake is done when skewer inserted into the cake comes out clean. Remove from steamer and leave to cool. 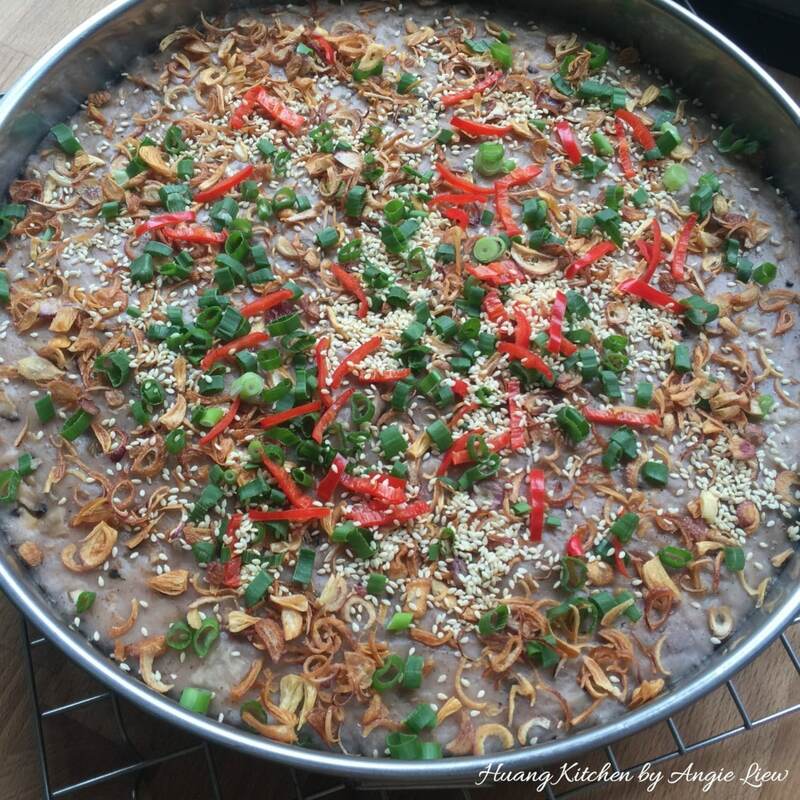 Sprinkle yam cake with fried shallots, chopped spring onions, sliced chillies and toasted white sesame seeds before serving. And we're done! Cut and serve with some chilli sauce on the side. As always, ENJOY! Tips on choosing yam: Choose yam that is light for its size. Lighter yams have less water and are usually more fluffy, powdery and fragrant. Make sure the yam skin is firm, as soft spots on the skin is a sign of rotting. Do not keep yam in refrigerator. Instead, keep in a pile of newspaper uncovered as yam needs plenty of ventilation. Otherwise, it will rot very quickly. 500 grams of yam when peeled will yield about 350 grams. The yam must be fried and seasoned while it's hot to bring out the full yam flavour. 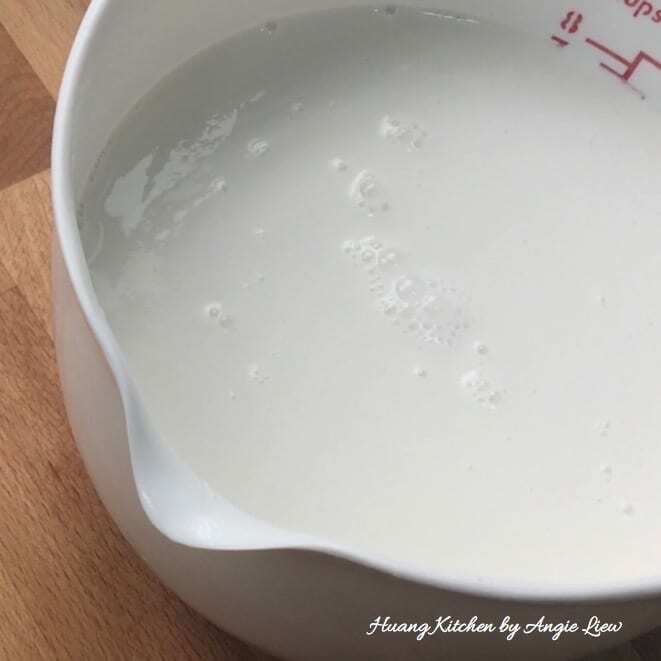 In general, use 2 bowls of water for 1 bowl of rice flour to make the flour batter. If a softer yam cake is preferred, dish up the batter when its thinner. If a harder yam cake is preferred, allow the batter to cook longer till it becomes thicker. Wheat starch (tang mein flour) helps to make the cake softer in texture. If not available, substitute with an equal amount of cornflour. The process of stirring the batter into the yam mixture must be done slowly. If it is too dry, add more water. If it is too wet, stir longer to reduce the water. Do not let the yam brown when frying or it will turn leathery. Be sure to use a spatula to press down yam batter in the steaming tray. This is to push out any air that is trapped so the yam cake will be firm once steamed. Steamed yam cake must be left to cool completely before it can be removed from the steaming tray. 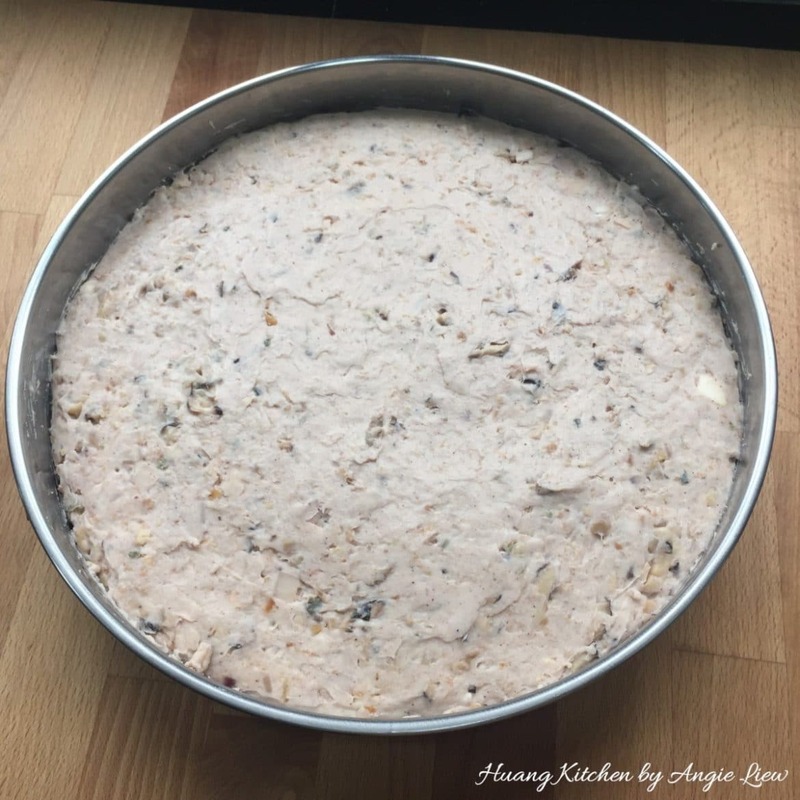 Yam cake can be prepared a day earlier. Keep in the refrigerator and re-steamed when needed. Then only garnish with the condiments when its time to serve. This way, it makes hosting a party having yam cake on your menu easier. The cake can be stored in refrigerator for up to a week. Cool the yam cake before storing. Cut into thick slices, pan-fry until both sides turn golden and serve with some chilli sauce.